I am often asked to help resolve Permission issues, especially on implementations that grown over time, and have had several different administrators. I developed a small utility that allows rapid navigation of the Identity hierarchy for a User. Import this Package as Root account (required because it adds an Action to the User itemType). Select a User from the main grid, and right mouse to open the wizard. You can double-click on any node in the Identity hierarchy to open that Identity for modification. 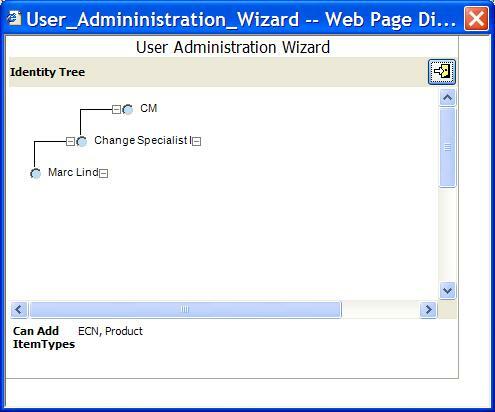 In the bottom frame of the Wizard, the list of non-core ItemTypes that this user has Can-Add access to is listed. The itemType names are hyperlinks, and you can click to open the itemType for modification. Please let me know if this is useful, and what other features could be added to simplify the administration of large user populations and complex permission schemes.